We are very happy to announce that Tania, who is performing studies for her medical doctor in our lab, collaborating with Prof. Andreas Kulozik’s group at the University clinics, Heidelberg, was recently awarded the Junior Career Fellowship (JCF) of the Heidelberg Research Center for Molecular Medicine (HRCMM). Her work will be part of the MMPU group Molecular Pediatric Oncology (led by Jan Korbel and Andreas Kulozik). Congratulations! Author Nina HabermannPosted on November 13, 2018 November 13, 2018 Categories UncategorizedLeave a comment on Junior Career Fellowship for Tania! Together with Stefan Pfister (University clinics Heidelberg), Jan Korbel is receiving the Heidelberg Molecular Life Science (HMLS) Award 2018 – congratulations! The award honors internationally recognized achievements of his scientific research in life sciences and acknowledges not only recent scientific breakthroughs but also his effort in mentoring young scientists and success in initiating new research activities. The award ceremony will take place on December 12th at 5pm and you can find more information here. Congratulations, Jan! 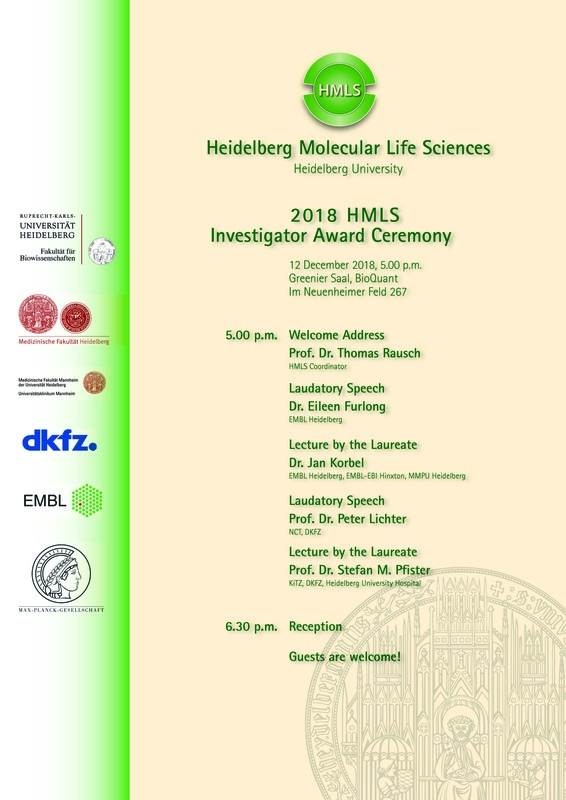 Author Nina HabermannPosted on November 13, 2018 Categories UncategorizedLeave a comment on Heidelberg Molecular Life Science (HMLS) Award 2018 for Jan Korbel! Ianthe van Belzen is the latest addition to the Korbel group: coming from Utrecht, the Netherlands, she is doing a research internship with us as part of her Molecular Cellular Life Science master working together with Busra and Tobias. Find out more here. Author Nina HabermannPosted on November 8, 2018 November 8, 2018 Categories UncategorizedLeave a comment on Welcome, Ianthe! October was “busy” for the group as we welcome four new group members: Patrick Hasenfeld joined the group at the beginning of October as a new Research Technician. He was followed by our two new PhD student who will be busy with the Predoc course in the upcoming weeks, Maja Starostecka and Wolfram Höps. Finally, Tania Christiansen joined last week and will do an internship with us for the next months. Check out the people section for details! Author Nina HabermannPosted on October 23, 2018 October 23, 2018 Categories UncategorizedLeave a comment on Welcome, new Korbel group members! Author Nina HabermannPosted on July 12, 2018 July 12, 2018 Categories publicationsLeave a comment on New Publication in Bioinformatics! We are very pleased to announce that Jan received the 2018 Pezcoller Foundation – EACR Cancer Research Award today at the EACR25 Congress in Amsterdam. This prestigious award is presented biennially to recognize the awardee’s scientific excellence in cancer research. Author Nina HabermannPosted on July 3, 2018 July 4, 2018 Categories peopleLeave a comment on Congratulations, Jan! The Korbel group spent three days packed with science (and sun) at Lago di Como in May 2018! Author Nina HabermannPosted on July 2, 2018 July 2, 2018 Categories peopleLeave a comment on 2018 Korbel group retreat! After joining our group in July 2014 Sascha successfully defended his PhD on May 14th! Author Nina HabermannPosted on June 26, 2018 July 2, 2018 Categories peopleLeave a comment on Congratulations, Sascha! In a new publication on childhood medullobastoma in Lancet Oncology we propose criteria for routine genetic screenings based on clinical and molecular tumour characteristics. Please also see the feature on the EMBL webpage here. This work resulted from a large international collaboration with researchers e.g. from St. Jude Children’s Research Hospital in Memphis, and Hopp Children’s Cancer Center at the NCT Heidelberg (KiTZ). Author Nina HabermannPosted on June 25, 2018 Categories publicationsLeave a comment on Congratulations, Sebastian!